We’re excited to celebrate the third annual Children’s Hospitals week hosted by Children’s Miracle Network Hospitals March 18-24. How you can participate in Children’s Hospitals Week: Wear a bandage and post a photo on your social media account while sharing that children’s hospitals like Children’s Healthcare of Atlanta need donations using #ChildresHospitalsWeek. You can get your own FREE #ChildrensHospitalsWeek bandages at https://freebandages.childrensmiraclenetworkhospitals.org. Tune in to our LIVE-athon and learn more about the kids treated at hospitals like ours across the country on Facebook.com/CMNHospitals or Twitch.tv/ExtraLife4kids on Wednesday, March 20 at 8pm ET. Start a fundraising campaign on CMNHospitals.org/fundraisers, on Facebook or directly to us on CMNHospitals.org/donate to help kids like Caroline. 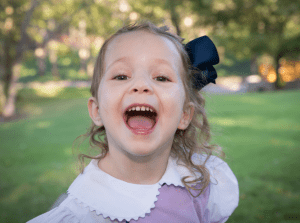 The day before her surgery, 3-year-old Caroline Brewer was cheerfully running down the halls of the Aflac Cancer and Blood Disorders Center of Children’s Healthcare of Atlanta. Her parents, Jamie and Matthew, delighted in seeing her so happy, but watching Caroline laugh and play was heart wrenching. Caroline had brain cancer and a softball-sized tumor nestled at the base of her brain. The official diagnosis was anaplastic ependymoma. Her neurosurgeon was hopeful, but said that if she survived surgery, she would likely be paralyzed on her left side, and the ophthalmologist predicted she would be blind. During her eight-hour surgery, Jamie and Matthew prepared for the worst. But, when the surgery was over, and to their amazement, Caroline was sitting upright in bed and smiling. She was not blind or paralyzed. The neurosurgeon was able to remove the large tumor from her brain. She walked out of the hospital seven days later. She then underwent two months of radiation, lost her hair and required physical therapy briefly, but Caroline was a champ. During her six-month MRI in November 2017, another brain tumor was found. The Children’s neurosurgeon and the team were once again able to remove the tumor. After treatment, Caroline looks forward to a cancer-free future.